Daniel Kann was successful in obtaining the best outcome possible for our brother... Had it not been for Daniel Kann, I truly feel the result would not have been nearly as positive. Dan is professional, attentive and personable. He’s always willing to answer questions and never condescending. Although in the courtroom he’s a fierce advocate, his compassionate demeanor and friendly nature help any client feel at ease. He loves what he does and it shows. I endorse this lawyer……. I have known and worked with Mr. Kann for many years now. He is a knowledgeable, hard working, and an extremely gifted lawyer. I would not hesitate for one minute to have Mr. Kann represent a good friend or family member. 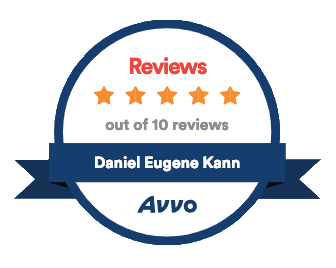 I was very pleased to have chosen Mr. Daniel Kann to handle my case. Mr. Kann was very professional. He answered all my questions and handled my case in a timely manner. I would highly recommend Mr. Kann. Mr. Kann helped me get through a legal nightmare. His guidance and knowledge of the legal system was a true blessing. I would highly recommend his services. I was facing two serious felony drug charges and the possibility of serving 6 years in state prison. I was extremely concerned about my case and future. The prosecutors had a good case against me. Thank you for the good news on John’s matter, and thanks for the excellent work! You did a great job for John— he really appreciates it, and so do we. You are more than worth your fee.